It’s OK to Help Yourself, First. I just got back from a 5 day all inclusive vacation to Mexico. Sounds amazing right? Sure. For the most part. For me though, traveling is a much needed time for introspection. I take the time away from my day to day life to really look at my life from all angles, with no distractions or influences from anyone around me. I’ve recently realized without it I actually become an emotional lunatic. While I was sitting on the plane waiting for take off, I was absent-mindedly listening to the flight attendant go through their speech about how to survive a crash. They got to the part about putting on your oxygen mask first, before helping your children or others. This got my attention. I’ve listened to this speech several times on flights across the world. But never before had I traveled, as a mother. My daughter wasn’t with me, mind you. But she was safely at home with my parents and as always, thoughts of her were in the back of my mind. This was, in fact, my first trip away from her for any length of time. Why in the world would I not help her first? Why would I waste time on myself, when she needed my help? Because I can’t save her, if I’m not breathing. A bit of an extreme hypothetical… but an accurate one. As mothers, as women, and as humans, we give of ourselves first. We give and give and rarely replenish ourselves. There is a saying that goes “You can’t pour from an empty cup.” You might think you’re doing fine. You might think you can continue to give. But much like my 18 month old with her tea set, you’re just pretending to pour. There’s nothing in your cup. You’re empty. You have nothing left to give. The beauty of an empty vessle though, is that it now has the great potential, to be filled up. How do you refill yourself though? How do you find the energy to keep giving of yourself to others who need you? Don’t forget about who you were before you were a mother. What did you do to make yourself feel good before you had your army of minions? Find the time. Stop making excuses. You have the time. All you need is an hour or so every day. Or a couple hours once or twice a month. Or perhaps, what you need, you can do everyday, all day. Here’s a list of things I do, to recharge and replenish my soul. Travel- This isn’t something everyone can do to it’s full capacity. It takes time, and money, to travel long distances. A road trip to the beach though, is probably within reach. Bring the kids. Give hubby and the kids a bucket and a shovel and send them on their way and just bask in the sound of the waves and the feel of the sun on your skin. However, if you have the means to see how another culture lives… do it. It’s extremely eye opening. Read– We make our kids read. In school they forced us to read at least 20 minutes during English class. Why? Because it’s good for us. Whether you’re reading non-fiction to learn something, or fiction to escape, reading is good for our minds and can fill our souls with knowledge and wonder. Bubble Baths– Spending an hour alone, immersed in fragrant bubbles and hot water is relaxing and rejuvenating. I also get the chance to scroll through Facebook uninterrupted, shave my legs, or as above, read. Splurge– On myself. Every so often I spend a little time, and money, on myself. It seems selfish and I struggle with a bit of mom guilt every time I spend a day getting a tattoo, or doing a photoshoot. Sometimes all it takes is buying myself new underwear. I am a woman, and a human, and I deserve to feel good about myself. Date Night- It took two people to create the tiny human currently sucking the energy out of you. Those two people need to remember why that little love child was created. Fall back in love with your partner and you’ll feel lighter than ever. Laugh- I try not to take parenting, or life, too seriously. The only way I get through a lot of situations is to laugh about it. Cracking a joke and making people laugh makes me feel good. This is something I can keep with me every day, all day. 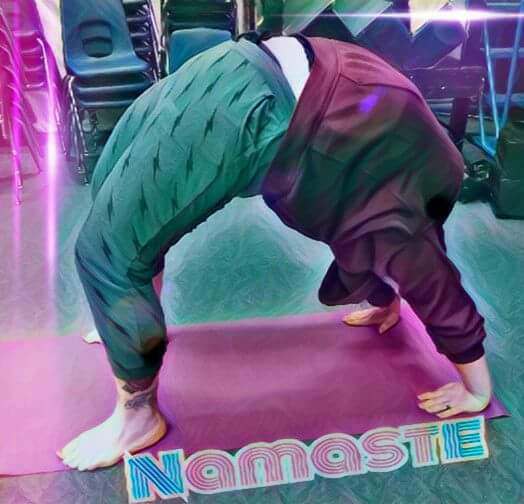 Yoga- It started as a way to help with post partum back pain and turned into an hour and a half, once a week, to truly relax and do something healthy for myself. I felt like I was really accomplishing something. I’m considering switching to kick-boxing to help with energy and weight loss. But whatever you’re interested in, take a class or make the time and just do it. It’s taken me well over a month to finish this entry from beginning to end. Simply because I didn’t take the time. I actually had to stop and think about what I do for myself. It’s really hard to take care of ourselves when others need us so badly. But we need to try. I’m totally ok with being a work-in-progress.